But every morning, as you rush out of the house to go to the office, you can’t be bothered to dig up the right box to return those too-tight pants. You also don’t remember where you filed the return shipping label. On top of all of that, you can’t make it to the post office today, not with the six meetings and hundred emails on your to-do list. And so that pair of too-tight pants just sits and sits, taunting you every night. That’s the scenario that Shyp is trying to save you from. The San Francisco-based shipping startup released a product today called Shyp Returns that wants to make returning an item you bought during your last “click, click, click” shopping spree as easy as it was to buy it. For $5, Shyp will pick up, package, and send any item. That’s its sell. 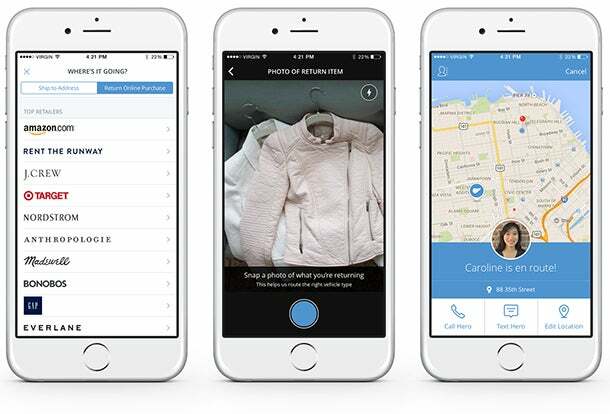 With Shyp Returns, you enter an order number and snap a quick picture of the item, and for $5, a Shyp Hero (that’s what the startup calls its couriers) comes to you, whisks away that pair of too-tight pants, and away they go. If you happen to be returning an online purchase to one of the most popular Shyp retailers, then you save yourself a step of entering the return address or finding the prepaid return shipping form. Featured retailers are expected to rotate, but right now, they include the likes of Zappos, Banana Republic, Overstock.com, Amazon.com, RenttheRunway.com, J.Crew, Gap, Bonobos. If you want to return an item to a retailer that isn’t featured, then you will need to give the prepaid shipping label to your Shyp Hero when they come and collect your item to be returned.